Sleaford CC First XI stayed hot on the heels of the Lincs ECB Premier pacesetters as they dispatched Bourne in good style on Saturday. Their seventh win of the season kept them within four points of second-placed Grantham and 29 points behind leaders Bracebridge Heath. Sleaford, sponsored by Baker Plant Hire, made early inroads after Bourne won the toss and batted, with Ian McPeake bowling Temple for four and Cameron Hall having O’Connor caught by Burford for 0 (4-2). Sam Evison and Peter Morgan playing positively as they rebuilt, putting away any over-pitched deliveries, and took the score to 43 when Evison was bowled by Harbron for 11. Morgan was joined by Robert Dunn and moved past 50 in a useful stand, until Dunn was caught by Shorthouse, off Adi Sreedharan, for 26. Morgan continued to play his captain’s innings with ease and confidence, but Sreedharan had Robert Bentley LBW for 14 and Tom Bentley soon followed, bowled Hall for seven. Matthew Kidd was bowled by the impressive Sreedharan for 0, and Jon Howard joined his skipper who had moved to 95 when he was caught by Ross Diver, off Hall. Hall picked up Xipu for four and Glen Smith for one to return excellent figures of 5 for 26 and bowl the hosts out for 176 in the 46th over, with Sreedharan claiming 3 for 36. Ross Diver and captain Tom Shorthouse began the reply very positively, mixing boundaries and rotating the strike to move the Sleaford on score quickly and take them past 50. The partnership continued to flourish, with both batsmen moving past 50 as the Bourne attack struggled to break through. Shorthouse was finally caught by Sam Evison off Tom Bentley for 62 (130-1), but Andy Hibberd quickly got under way with boundaries. Diver continued to show control and Hibberd had reached 28 when he was caught by O’Connor off Matthew Kidd for 28 with the score on 162. 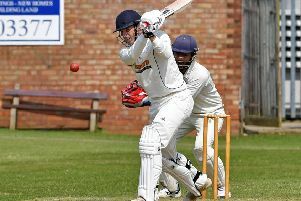 Matt Mountain (5 not out) joined Diver to secure an eight-wicket victory in the 35th over with Diver carrying his bat for an impressive 76 as Sleaford earned 20 points. On Saturday the First XI entertain Louth at London Road from noon.